Pooja Chandrashekar, a 2015 graduate of Thomas Jefferson High School for Science and Technology (TJHSST) and current freshman at Harvard University, introduced TJHSST Principal Dr. Evan Glazer by explaining how he impacted her life. 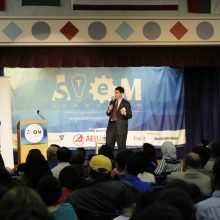 Dr. Glazer’s presentation answered how parents can maintain their child’s interest in STEM. He outlined six key factors that motivate students to pursue STEM: awareness of career opportunities; academic preparation and achievement; identification with STEM careers; self-efficacy; external environmental factors; and interest, enjoyment and motivation. Awareness of career opportunities — “There’s a considerable gap in skills. We have career fairs working to get students involved from a young age, along with special interest groups,” such as Discover Your STEM Type, which create awareness. 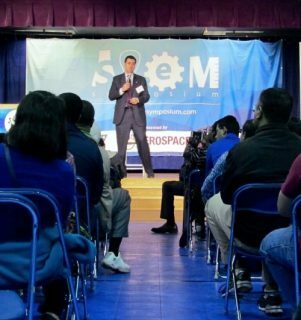 Interest, enjoyment and motivation — It’s also about having access to opportunities, Glazer said, and referenced GMU STEM for elementary students and hackathons as examples of how students can get involved locally. 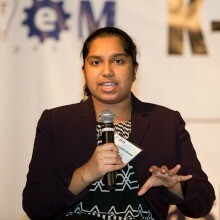 Chandrashekar has a record of achievement in STEM and mentoring younger girls. When she graduated from TJHSST, The Washington Post announced she was accepted by all 14 schools she’d applied to — including the eight Ivy League universities — and Stanford, MIT, Duke, the University of Virginia, the University of Michigan and Georgia Tech. Chandrashekar chose Harvard and is studying biomedical engineering, global health and health policy. Her interests also include computer science, neuroscience and entrepreneurship. She is passionate about encouraging young people to pursue their interests in STEM. While still a high school student, Chandrashekar created a nonprofit organization, ProjectCSGIRLS, dedicated to encouraging young girls around the world to pursue careers in the STEM fields and closing the gender gap in the tech industry. 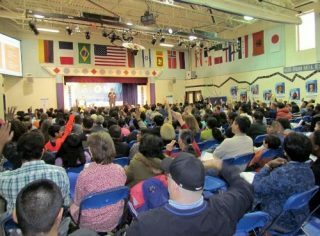 The 2016 K-12 Stem Symposium is a free, exciting and all-day forum that equally engages children, parents, and teachers, coupled with corporate, government, academia and non-profit executives alike from the STEM fields. The next K-12 STEM Symposium will be held on March 18, 2017.